As a coffee enthusiast, I never settle for pre ground coffee beans. I want my coffee, freshly ground and brewed every morning. There something about freshly ground beans that taste uniquely delicious and the aroma… simply amazing. The problem is though that grinding beans in the morning can be a hassle when I’m in a rush or distracted and that’s exactly why owning a coffee maker with burr grinders built in can be so convienient – I litterally start the brew without adding beans to the hopper or scooping grind into a filter basket. Obviously grind and brew coffee makers just make everything in the morning so much easier to get done, especially when you are pressed for time so I don’t blame you for wanting to get one for yourself. If you are just like me, someone who won’t settle for pre-ground coffee, then check out these coffee makers with built-in burr grinders. 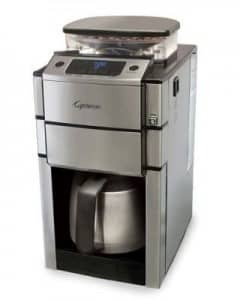 Cuisinart DGB-900BC Grind & Brew Thermal 12-Cup Automatic Coffeemaker, Brushed Stainless/BlackThe Cuisinart Burr Grind & Brew Automatic Coffeemaker is one of the best selling coffee maker in the market. Its built-in burr grinder and 8 ounce bean hopper holds a half pound of coffee beans perfect amount to brew coffee for the day. It is a 24 hour fully programmable. Hence, you can set it ahead of time. With an auto shutoff and brew-pause feature for added convenience. To assure you that you always have a delectable cup of coffee, the charcoal water filter and the permanent gold tone filter purify the water. Don’t be left behind, get the Cuisinart Burr Grind & Brew Automatic Coffeemaker now. Capresso Coffeemaker with Conical Burr GrinderWhen it comes to coffee maker with grinder the Capresso Coffeemaker with Conical Burr Grinder is one of the most compact and elegantly designed. It is fully programmable making the brewing and the grinding process very easy by just a touch of its digital panel located in front of the unit. 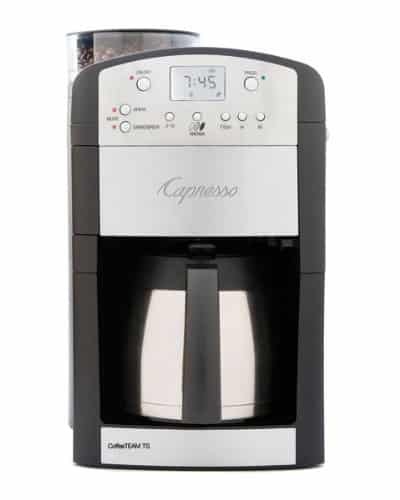 This coffee maker features include a timer function, a pause and adjustable strength setting. It also comes with a charcoal water filter that helps remove more than 80% of water impurities that can alter the taste of your coffee. In addition, this coffee maker has a unique burr coffee grinder because it has 5 grind setting. This makes this coffee maker one of the top selling unit. It can brew 10 cups at one time that is more than enough for you and your buddies to enjoy. Here are a few more options. They are all good machines with built in burr grinders. Do All Grind and Brew Coffee Makers Use Burr Grinders? In my experience I’ve never come across a combo coffee maker grinder unit that used a whirling blade grinder. They all use some form of a burr grinder, be it stainless steel or ceramic. Now, quality of the burr grinding mechanism can vary greatly so remember, you tend to get what you pay for. I only wish I could get one of these with a removable reservoir, that would make them even more convenient. When it comes to hot beverages, nothing beats a freshly ground and brewed coffee. You want to know why? Well, most pre-ground coffee beans lost most of its flavor and aroma in the process. So, when it comes with a coffee maker make sure that you purchase one, which has a built in coffee grinder to have the best tasting coffee. Here are some more of the best coffee makers with built in grinders that deserve a place on your countertop. KRUPS KM7005 Grind and Brew Coffee Maker with Stainless Steel Conical Burr GrinderCoffee enthusiasts are amazed with the KRUPS Grind and Brew Coffee Maker. It has 5 levels of grind, 3 coffee strength and aroma function for that great coffee experience. It also has the pause and serve feature that lets you take the carafe any time you want even in the process of brewing. 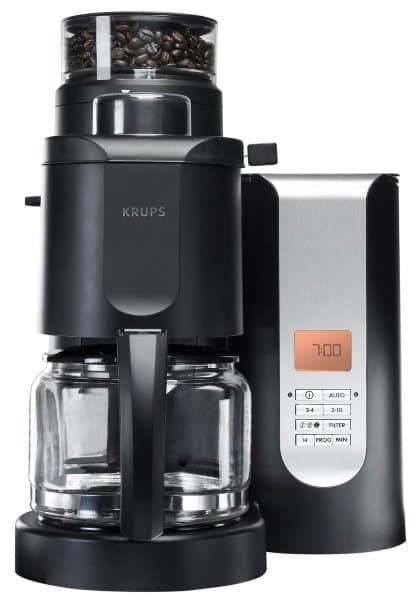 The Krups KM7005 makes brewing easy as 123. It is programmable that you can set it on automatic brew mode and all you have to do is sit and wait for not only a cup, but as much as 10 cups at one time. It has a Duo Filter water system which purifies water for your coffee. It also makes cleaning a lot easier by just removing the filter basket, rinse and you are all set. This is really an impressive piece of equipment. 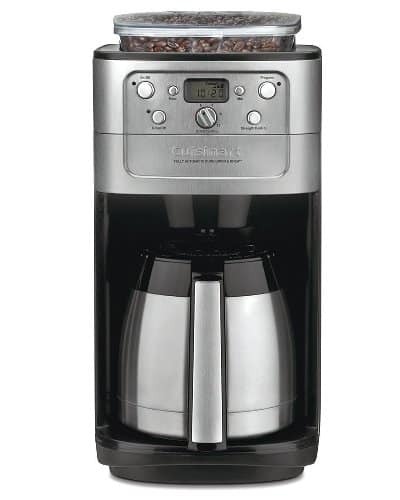 Cuisinart DGB-550BK Grind-and-Brew 12-Cup Automatic Coffeemaker, Black/Brushed MetalWhen it comes to coffee equipment, Cuisinart is known to produce the best one in the market. 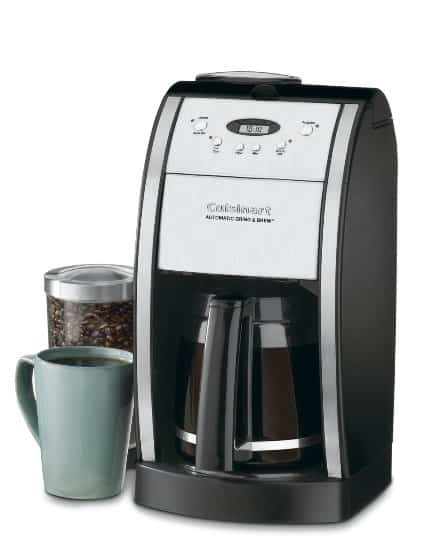 The DGB-550BK Grind-and-Brew 12-Cup Automatic Coffee Maker is another high quality unit from this company. It never fails to brew up to 12 cups of great tasting coffee. The built in coffee grinder automatically grinds just the right amount of coffee beans just before the brew cycle. With as strength selector features that gives you the option of mild, medium and strong. The Gold tone commercial style permanent filter removes water impurities and assures that you’ll be getting only the best coffee every time. Waking up in the morning with this coffee maker with a built in grinder is so awesome. A Few More Popular Options to Consider. Before I leave you with our recommendations I wanted to touch on this question that we get a lot around here – do grind and brew coffee makers actually work good? The question is obviously multi-faceted. First there are grinders that need to perform well and then there is the coffee maker that needs to make good coffee. Truth be told the majority of these coffee makers are average at both tasks and the complexity of the machines make them significantly less appealing then getting say for instance an entry level electric coffee grinder and a good automatic drip coffee machines. The best of the mid range grinders cost about that same as one of these devices and the best drip coffee makers are priced similarly so to keep the price in line you would have to buy on the low end of the pricing spectrum to spend the same amount. The benefit of doing that would be ease of cleaning and maintenance with the separated devices but that takes off of the convenience out of owning a coffee maker that also grinds your coffee beans. If you are looking for one of these I think you’ll be perfectly happy unless you are used to using super high end equipment. Do they work good? We think they work good enough for the benefits of what they do. Are they worth the money? Well, that’s up to you.